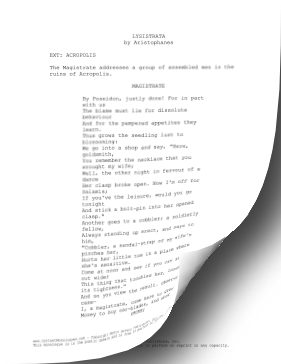 This comedic monologue is from Aristophanes' classic Greek play, Lysistrata, and is spoken by the Magistrate, an adult man. The Magistrate addresses a group of assembled men in the ruins of Acropolis. And for the pampered appetites they learn. And stick a bolt-pin into her opened clasp." Hurts her little toe in a place where she's sensitive. This thing that troubles her, loosen its tightness." Money to buy oar-blades, and whathappens? The women slam the door full in my face. And I'll chastise this their impertinence. What do you gape at, wretch, with dazzled eyes? Peering for a tavern, I suppose. Come, force the gates with crowbars, prise them apart! I'll prise away myself too.